With readings of encouragement and inspirational quotes, this devotional helps parents prepare their hearts for their children's independence, whether their kids are just starting kindergarten or graduating from college. Parents let go of their children every day, even in ways they don't realize. The 52 devotional readings within shine a light on all the times readers have loosened their grip on their children and encourages them to continue to let go in life-giving ways. Written by a parenting and education expert, The Joy of Letting Go will comfort and inspire parents in all seasons of parenting. Dr. Vicki Caruana is the author of 20 books and the blog Apples & Chalkdust-named after her bestselling book that has touched the lives of a million educators around the world. Caruana is one of four parenting experts on "Starting Points," Focus on the Family's parenting DVD series. Formerly a public school teacher and a homeschooling mom, Vicki is now an assistant professor of education at Mount Saint Mary College in New York. She lives with her station wagon loving husband, Chip, in Newburgh, New York and has two grown sons in Colorado Springs. Find out more about Vicki at http://vickicaruana.blogspot.com. This is a book I will need to read many times, many, many times over the next several years leading up to the time that my children will be adults and heading out on their own. "The Joy of Letting Go" is a nice little book that is divided into 52 short chapters, one for each week of the year. Vicki points out that we are not letting our children go at the big milestones such as graduating high school or entering college, but really we are letting go of them each day of their lives beginning from birth as they meet each milestone. This book is a great reminder that once I became a mother, I will always be a mother, but that role will change and grow with my child. Each chapter ends with "thought pokes" that are great to reflect upon and help add extra insight from the reading of the book. This is a great collection of devotionals that have me seeing transitions differently and the process of letting go not quite as scary. "The Tech-Wise Family: everyday steps for putting technology in its proper place" by Andy Crouch is a must-read for every single parent. This book not only had me thinking about my family's technology use, but my own use and when I use it and my children seeing me use various devices. I do not ever want my children to think whatever I am looking at on a screen is more important than spending time with or listening to them. Andy shares his perspective on what a smart family technology wise is and he ties in research and statistics that have been concluded from various studies. This is a small book but there is so much valuable information packed into the pages. As a society we are glued to screens - our phones, tablets, e-readers, social media. We are connecting with others via text messages, Snapchat, sharing our daily lives with others through Facebook and Instagram and we are reading and watching television shows through our e-readers and tablets, our own individual screens. Books are being replaced with e-readers and this is affecting our brains just as much as playing video games and watching television as it is a whole different experience for our brains to process. Andy shares all this information and then strategies and tips to be smart as far as technology usage and finding a right balance for yourself and your family and having it have its rightful place in our daily lives and our family's routine. Evaluating yourself-being mindful of who you are and what you are doing-is necessary and can lead to positive change. But what about the dark side of introspection? Do you ever feel weighed down and exhausted by your own self-analysis? Perhaps you made a mistake, said a careless word, or even messed up big time. Your self-examination spirals into a full-blown cross-examination. You keep revisiting what happened. Your mind circles around the event, fruitlessly trying to somehow make the outcome different so you don't feel the embarrassment, shame, and regret. There is an outward-focused God who delights to rescue an inward-focused people and lead them into a better way to live. When we truly understand it, we'll see that the gospel actually sets us free from thinking about ourselves too much. We can seek after and pray for the peace and joy-the sanity-that comes from thinking about ourselves less often. Think Again includes practical instructions for self-examination, fighting false guilt, breaking free from hyper-introspection, and more. Ultimately, Think Again demonstrates that the solution to thinking too much about ourselves is to look to Christ, and it gives readers the tools to begin to turn from the mirror. "Think Again: relief from the burden of introspection" is a great read. We are constantly analyzing ourselves, how we are as a mother, a wife, a friend, how we look, how we are perceived by others. Jared shares personal stories as well as Biblical accounts throughout this book to help the reader work through exploring how her views of herself and self-analysis are impacting her life. I really enjoyed the section that Jared shared about "selfies" and how this and social media play such a huge role in today's society. While some view selfies as a reflection of narcissism, some see them as reflecting self-esteem and a way of exploring how one feel's about herself. Being constantly hard on ourselves can drag us down and leave us never happy with ourselves. Jared helps each of us work through our thoughts and how we think about ourselves. Each chapter end with questions to think about and reflect upon to help apply and really make changes in our thinking and how we live. Cynthia's books are always so inspiring and full of heart. Her latest, "A Fragile Hope," is no exception and it is a beautiful story of forgiveness, grace and hope. Josiah's marriage is in shambles and he is oblivious to this face until a crisis. Josiah is not sure how to handle this, being his own, as he is a professional in this area. Karin is unhappy, she feels that others know and understand her better than Josiah, her own husband. When Karin is in an accident Josiah learns unsettling news and is forced to put the pieces together and realize the true state of how things are. Cynthia has done an amazing job of weaving together this story filled with heartache, and yet hope as well. The characters are so real and are so easy to empathize with. I also loved the "sayings" at the beginning of each chapter; this is such a nice touch and addition to the book. I highly recommend this book, you will not want to stop reading once you start! Have you ever considered your life as an audition? "Chasing Famous" is Lisa sharing her heart of getting back on track with chasing God and living life with God as the focus instead of herself. Every day we are each trying to improve ourselves for a certain role, be the model wife, be the mom who has the perfect home and the perfect kids, be the woman who can juggle all the hats she has to wear. However, it is not the life that God intended for each of us to live. Each chapter Lisa shares her story and her heart in, then a Biblical account was shared, drawing from various individuals from the Bible and their examples of living lives for Christ. Lisa then ends each chapter with questions to reflect on and answer. I really liked the layout of the chapters as it was easy to relate to Lisa as she was so open with her heart and life. Also, the Biblical accounts were familiar, yet there was some new insight I gained as well. Finally, it was easy to really take this book and relate it to my own life with the questions with each chapter. This is a great, easy read that will have you thinking about your own life. Friendships can be so tricky, and yet they are something that we yearn for in our lives. Women can be "catty," but yet once you really connect with someone and have an incredible friendship with another woman you do not want to let that go. Lisa-Jo Baker has shared her thoughts and encouragement on this subject in her new book, "Never Unfriended: the secret to finding and keeping lasting friendships." This is such an incredible book and one that really made me think about what I want in friendships and what I have had and currently have in friendships. Lisa-Jo shares so many great lines in this book, and one that really stood out is: "Maybe the most intimate, radical thing we can do for our friends is to show up." This is the whole purpose of friendships - to be present, to be someone who can be counted on to share the good and the bad with, someone to be a sounding board, someone to laugh with, someone to cry with, someone to just be there when needed. This is only one of the many, many insights that Lisa-Jo shares with the reader. I highly recommend this for women whom are seeking to build their relationships and have friendships to last. 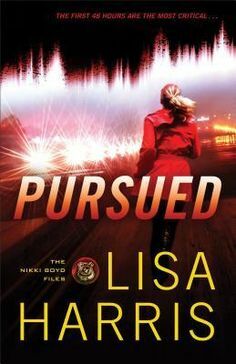 "Pursued" is book #3 in Lisa Harris' Nikki Boyd Files series and it is another exciting addition to the series. Nikki is flying back into Nashville and is nervous and excited as she will be seeing Tyler and will have to figure out her feelings and where their relationship may be headed. As Nikki and her seatmate Erika chat for a few minutes when the plane hits turbulence, and then crash lands, Nikki knows that Erika existed and was there even if no one else admits she was. Nikki is determined to find out what happened and she is pulled into an investigation as she is notified that Erika was a witness who was returning to Nashville to testify, but the marshal with her was killed in the crash and Erika is no where to be found. Lisa dives right into the action and brings the reader right back into Nikki's world. Nikki is such a great main character as she is easy to empathize with and I have loved seeing her character develop throughout this series. This is one not to miss out on for romantic suspense fans! I just love Irene Hannon's Hope Harbor novels! "Sandpiper Cove" is her latest and one of her best! Irene does an incredible job of mixing romance and suspense. Lexi is the Police Chief and Adam is an ex-con, so really they are opposites in so many ways, yet they are teamed up for a common purpose. Adam never would have expected to be interacting with Lexi like this and Lexi is desperate to keep an at-risk teenager from ending up in a horrible situation and going further down a path of destruction. Lexi and Adam's interactions portrayed forgiveness, hope and friendship and their relationship were so inspiring offering hoe and second chances. Hope Harbor is such a great place and I love the characters that show up in each story as they add much to the story and it is nice to see them again. I am looking forward to the next book in this series coming out! Are you lacking real faith in or love or Jesus? You might be "Getting Jesus Wrong." Getting Jesus Wrong recounts pastor and author Matt Johnson's personal encounters with a string of false saviors-false saviors that many, especially young adults, will recognize. Johnson's humor and transparency in recounting his own painful experiences will appeal to those who have tried a "brand" of Christianity and found it lacking. "Getting Jesus Wrong" is such a thought-provoking read. It will have you thinking about your beliefs and your personal walk with Jesus throughout this book while at the same time think ah I have never thought about this or that in that light before. Each of us have a personal relationship with Jesus, and each of us views Jesus a certain way. We are all influenced by our families, how we were raised, the church we grew up in or are a part of and how we have interpreted the Bible, among many other factors. However, some may be inaccurate and cause us to see Jesus a certain way while in fact Jesus Himself is trying to give us another message or really is something all together different from what we belief. This is a great book to help the reader feel stronger in his or her beliefs and really build that relationship with Jesus to a healthy and more "right" way of thinking and living. "Life After" - a book you do not want to miss! Katie Ganshert has an amazing talent of completely engaging the reader in the book that she writes, into the characters' lives and into the world that she has created. "Life After" is an emotional and thought-provoking read that will leave the reader asking her purpose in life and why things have happened that have happened in her life. Autumn is the sole survivor of the Tragedy on the Tracks, an incident that happened one morning when a bomb goes off on a train in Chicago. This is a typical Chicago morning, blustery, commuters going about their everyday lives, but it was not a typical day when 22 individuals are killed and only 1 individual survives. Autumn is left questioning why she survived, why is she the chosen one, what purpose was there to this tragedy. Autumn collects everything she can about the tragedy and the individuals lost, much to her family's dismay, and spends her sleepless nights completing one jigsaw puzzle after another. However, things take a turn when she receives letters and comes face to face with the daughter of the one of the individuals whom was killed because of the tragedy. Paul is shocked when he finds out what his daughter has been doing behind his back and he wants nothing else than to forget that awful day when his wife and the mother of his children was killed, it was a horrific event and he just wants life back to normal. Paul fears that Autumn is going to wreck any progress they have made with moving on. This story grabbed my attention right from the very first page. It was so easy to become a part of the story, I could picture myself there on the train, sitting quietly, observing the other commuters who were mindlessly checking email on their phones, texting messages, looking out the window, something that is a part of their everyday routine, not expecting anything out of the ordinary to happen. I could imagine Autumn's apartment with her puzzles, her closet of clippings and information and it was so easy to empathize with Autumn, Reese, and Paul as they are trying to adjust to their new normalcy. I highly recommend this book as you will forever be changed. This is nice hardcover cookbook that is filled with recipes, rich with family history and with beautiful photographs interspersed throughout. "Vibrant India" is a book that is more than a cookbook, it is a collection of family history to pass onto others and recipes to try and make new family memories of one's own. I was introduced to Indian food by my sisters during a sisters lunch a few Christmases ago, and I loved it. There are so many flavors with each dish, such variety and so visually appealing. The recipes included in this book will also help you to get more vegetables into your diet and not be bored with the same thing over and over again. There is such a wide variety of types of dishes included in this book such as ones for breakfast, salads, stir-fries, festive dishes and sweets. I am excited to try so many of these recipes and rotate more of these into my weekly menus. Unsinkable Faith, author and Proverbs 31 Ministries speaker Tracie Miles offers hope for women who struggle with negativity. Each chapter explores Tracie's and other women's personal stories, showing how they rose above their circumstances by transforming and renewing their minds. "Unsinkable Faith" is one of the best women's book that I have read! Tracie Miles has written a book that really caught my attention and is filled with so many tidbits of wisdom. It was as if Tracie was speaking right to me as she wrote in a conversational style and we were chatting over mugs of coffee. Tracie begins the book with sharing Molly Brown's story, a life of hardship, but she persevered through so many hardships throughout her life and was nicknamed rightly so "unsinkable." Tracie then shares her heart and a personal incident that left her reeling and in a negative mindset that she fought to overcome. This book is divided into 10 ten chapters and each one builds upon the other and each one is just as important as the other. The strategies, reflections and the challenges that are shared at the end of each chapter are great as it really helped me to apply each of the chapters to my own life and to really delve deeper into what was being shared in the book. I highly recommend this book and am eager to read more by Tracie.